while using significantly less water, space, and energy than traditional agriculture! Acquire the knowledge necessary to identify viable communities for aquaponics education. Partner, collaborate and optimize local relationships with like-minded organizations. Produce a diverse range of yield, spanning from direct outputs to indirect impact. Pay the knowledge forward by activating graduates to become experts and teachers. We’ve expanding into four additional countries – constructing various scales of food production systems, training centers & paying the knowledge forward through vocational education. From the essential phases of planning and construction, to the sourcing of local materials and labor – everything comes at a cost when breaking ground. Not only are you at minimum building a food system for a student or graduate, but you’re also creating jobs, building local infrastructure and changing lives. 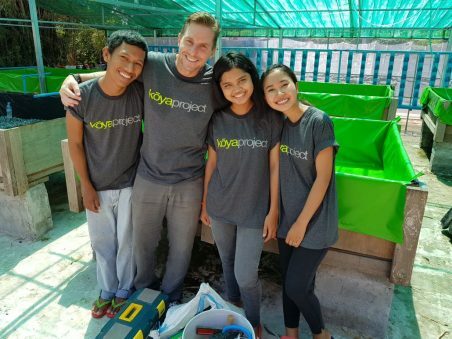 You just created a 3-month aquaponics class for at least 20 students, while being an active participant in helping pay the knowledge forward. School supplies, materials and the cost of a dedicated instructor is covered so that the children and adults in need can focus on one subject: learning. "How will my donation continue to bring impact in 5 years or decades from now?” We hear you, and that’s our starting point when planning for generation-shifting impact. As a Sustainability Sponsor, you’re contributing to a diverse range of reoccurring costs that ensure our project site is not simply surviving, rather thriving and flourishing.